Haya El Nasser, Environmental Reporter from USA Today, came down from Washington, DC, yesterday to explore Floyd’s grassroots similarity to the Slow City movement. This philosophy is very much at work in Floyd County today. There is a strong sense of local identity and a definite organized resistance to the loss of regional authenticity which comes from globalization of the food supply and the proliferation of fast food and big box retailers. 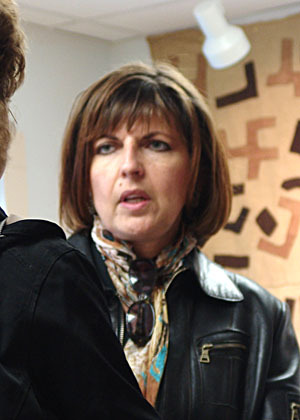 right and has written many articles about the environment, urban sprawl, and social issues. Haya and Tim Dillon, her photographer, started their day in Floyd with lunch at the Over the Moon Gallery/Cafe and were joined by local dignitaries, including writer Fred First and potter Jayn Avery. Haya did a brief tour of Floyd County and dropped in at the Jacksonville Center to get a closer view of our community focal point for rural creativity. 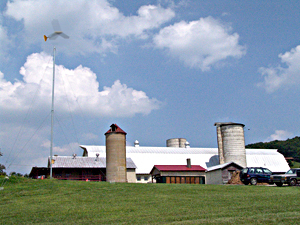 The Center is a converted dairy barn located on a hill overlooking Floyd with a view of the Buffalo Mountain to the Southwest. The white barn gleamed in the sun and a chill wind drove the wind generator blades into a shining blur. A perfect day to visit Floyd. The Jacksonville Center promotes the heritage and culture of Floyd County through classes for artisans, gallery exhibits showcasing regional artists, and an open studio program which acts as an incubator for those seeking a viable career as an artisan. Haya and Tim interviewed McCabe Coolidge while he was working at the wheel throwing pots. McCabe and his wife Karen are new tenants at the Jacksonville Center and are typical late-life artists who have come to Floyd after a lifetime of service in other fields. 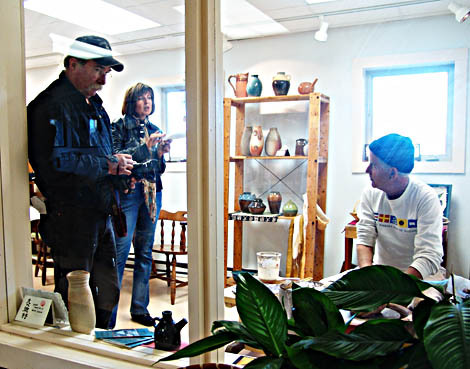 Their studio, The Nook, has already become a gathering place for visitors and local artists. 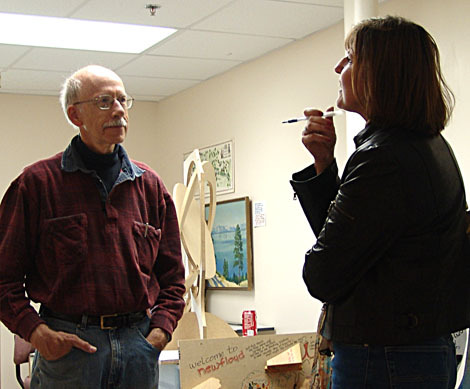 Haya also interviewed Bob Rogers, another tenant in the Open Studio Program. Bob is an architect transforming himself into an artist and has years of experience designing for sustainable living. Bob was able to explain some of the Sustainable Living activities taking place on the Jacksonville Center campus. Haya managed to visit the Canopy of Trees exhibit in the Hayloft Gallery, get a rundown on the Residential Craft School from Director Chris Shackelford, and chat with Erika Johnson of FloydFest. As she was leaving, she said what we have come to expect of many visitors, "I want to come back here and visit with my family!" We will be happy to see her return. This entry was posted in Interesting People Visiting Floyd. Bookmark the permalink. It’s so nice to have many eyes and voices telling the Floyd story. I check in with all the Floyd blogs so I won’t miss anything. Keep us posted on this one, David. I wouldn’t want to miss the write-up Haya does.